One 875 hp (652 kW) Mitsubishi Zuisei 13 14-cylinder air-cooled radial engine driving a three-blade metal propeller. A total of 1118 F1Ms were built. The F1M1 was produced only in protype. A small number were converted to the F1M2-K advanced trainer. 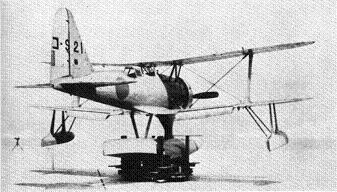 "Pete" was the only short-range observation float plane accepted for full production by the Japanese Navy, and it was standard on all carriers and battleships. It also operated from shore bases. Because of its outstanding maneuverability, it was occasionally operated as a fighter and dive-bomber in support of amphibious operations, when no enemy fighter opposition was anticipated. 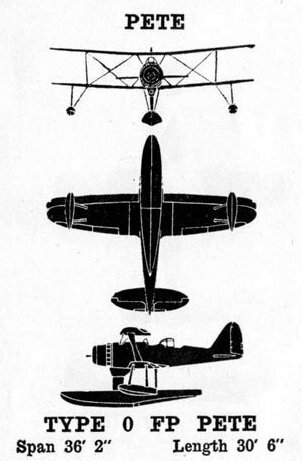 The design dated to late 1934, when the Navy issued a specification for a replacement for the E8N1 "Dave" to Aichi, Kawanishi, and Mitsubishi. The Mitsubishi design team, led by Hattori Joji, completed a prototype in June 1936. The design was very clean and outperformed the Aichi contender, but had poor stability. This was corrected in the F1M2, which was ordered into production by the Navy.